The Amazon Fire TV is a solid streaming box, but it's capable of doing much more than Amazon lets you know. 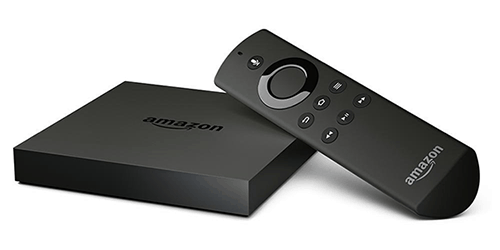 By playing around with Amazon Fire TV's debut settings and using the methods below, you can sideload Fire TV apps onto your device. That unlocks a variety of unofficial Fire TV apps, including web browsers, media center applications, and more. 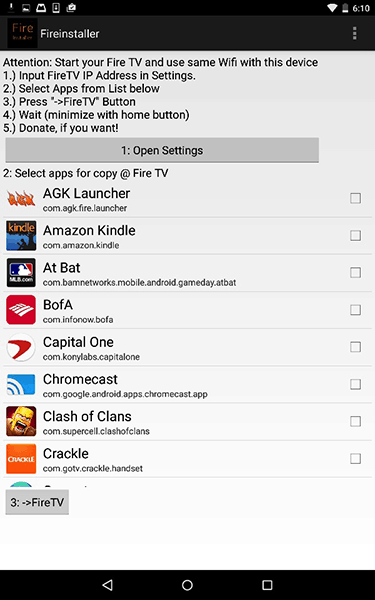 Want to know how to sideload Fire TV apps? We've got you covered. Below are four different methods for getting the job done: one that uses your computer, one that uses an Android device, one that uses a USB stick, and one that uses the Fire TV alone. Check out the pros and cons for each method, then try one out! This method uses Android Debugging Bridge, a utility that connects to Android devices from computers. It's ostensibly for Android developers, but since the Fire TV's OS is based on Android, we can use it to add new apps to our Fire TV. What you'll need: A computer and an APK file (we'll talk a bit about APK files in Step 4). Download ADB (Android Debugging Bridge) for PC or Mac. Setup on Mac is pretty easy, but there's an extra step if you have OS El Capitan. For most versions of Mac OS, just run the ADB-Install-Mac.sh file with Terminal. If you have El Capitan, you'll first have to restart while holding command-R, open terminal, and disable Mac's new security features with the command csrutil disable. Installation on PC can be a bit hairier, but the link we used is to an all-in one installation that makes the process pretty easy. A quick note: ADB isn't the only utility that you can use to connect your computer to your Fire TV. 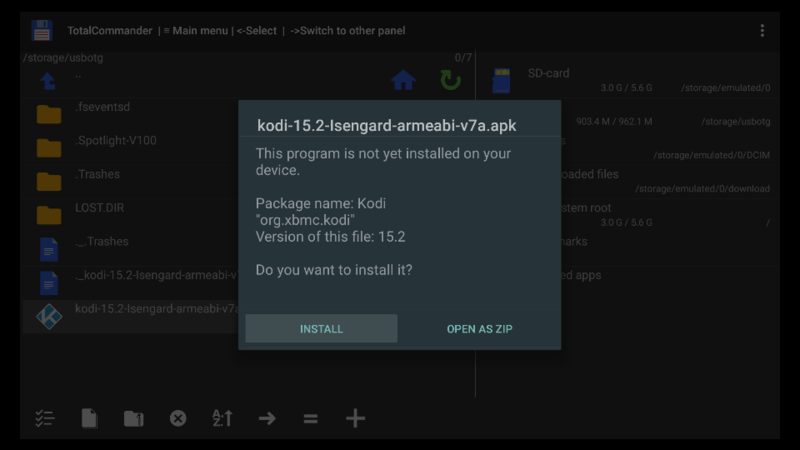 A couple of new utilities have emerged that try to improve on ADB by tailoring the experience more to Fire TV sideloaders. Among these are adbFire. They work similarly to ADB itself, and they're another option for sideloading. We just left them out for the sake of simplicity – we're just explaining one straightforward method for each device you might be using. On your Fire TV, navigate to Settings>System>Developer Options and turn ADB debugging ON. On the same options screen, set Apps from Unknown Sources to ON. You can find your Fire TV's IP address on the device by following the path Settings>System>About>Network on your Fire TV device. What's an APK file? It's the app! Android apps have the file type .apk. You can download APK files using an APK downloader (they can sometimes be a little sketchy) or look for the right file on APK Mirror. 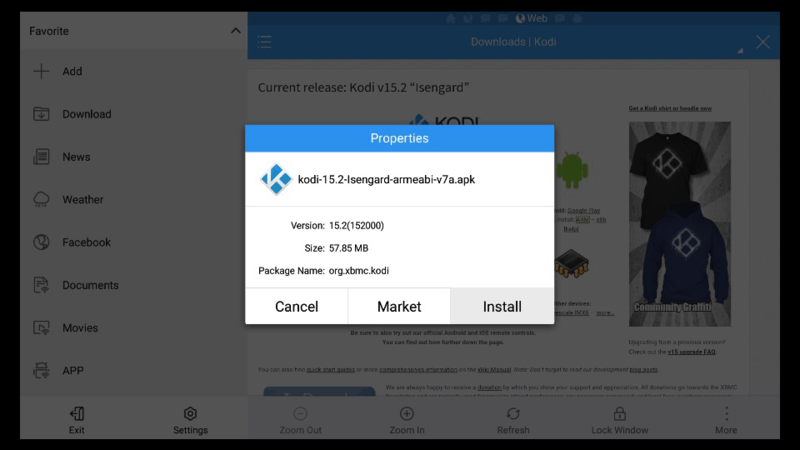 Kodi fans, you can find your download here. Note that the Fire TV has an ARM processor, so you'll want the APK files that say they work with that one (not the x86). If you do this correctly, you should see “Success” appear in the command line. There are a few Android apps that allows you to transfer Android apps to your Fire TV. This method is the most versatile of these, since you won't need a URL or an APK file on your computer. Of course, this is only an option for those of us with Android phones and tablets. The other drawback? Some of these apps work better than others, but all of them have their flaws. Check reviews to see if there are any issues specific to your device. What you need: An Android tablet or phone and an sideloading app. We're using Fire Installer in this demonstration, because we like it and it's free. We're using Fire Installer. It's in the app store. Easy! You can find your Fire TV's IP address on the device by following the path Settings>System>About>Network on your Fire TV device. Pretty much all of the sideloading apps either prompt you for the IP or have it in their “Settings” section (for Fire Installer, it's the latter). Fire Installer has a list of apps on the first screen you see, but all of them have you choose your apps somewhere along the line. You'll be able to add any app that's installed on your Android device, and many apps also support APK file installations. Just pick the one you want to push over to your Fire TV! In our app, this is a button right below the app list. It'll be hard to miss no matter what app you use. That's it! Now you just have to wait – installation can take a while when you use this method. 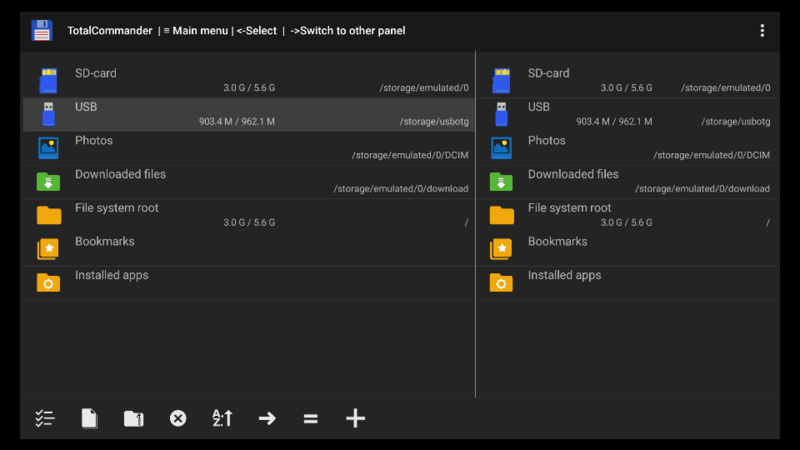 This method uses a computer to put the APK file (app) onto a USB stick, and then uses the Fire TV's USB port to load the APK file onto the Fire TV. It's a useful method for sideloading large numbers of apps, but it's a bit unnecessary if you're sideloading just one or two. 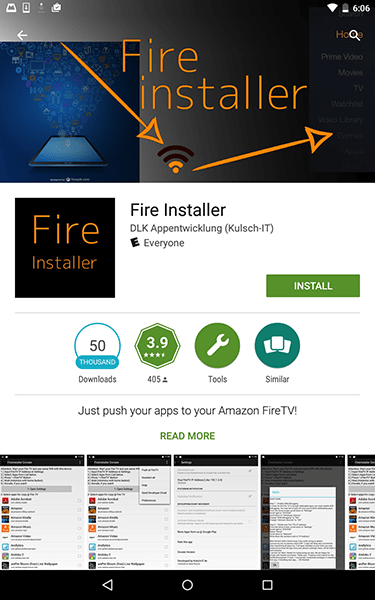 What you need: The Total Commander Fire TV app, a USB storage device, a computer, and an APK file. This method won't require debug mode, but you still have to allow apps from unknown sources. Go to Settings>System>Developer Options and set Apps from Unknown Sources to ON. Note that your USB drive must be formatted in FAT32. Your Fire TV will take a few seconds to mount the device. Don't have it? You can download it for free in the Amazon app store. This screenshot shows us highlighting the mounted USB drive in Total Commander. You'll have to select the right directory for the USB device and then click on the right APK file. Select install and then do it again to let Total Commander know that you're super-sure. Wait for the installation to complete, and you should be all set! 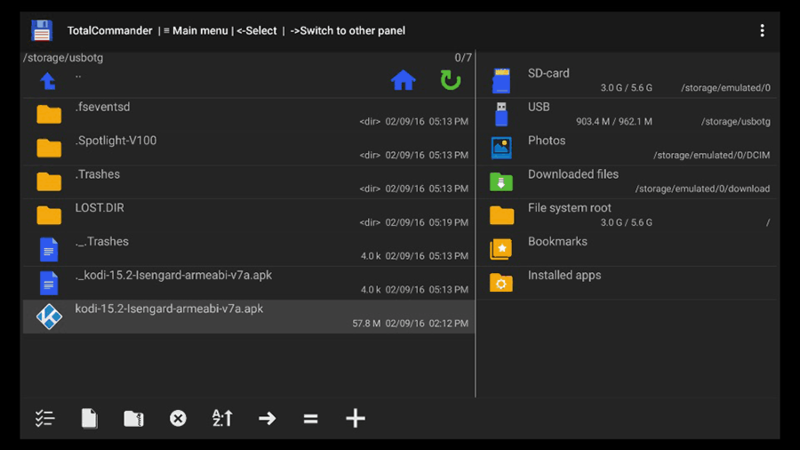 This sideloading method works by using a file explorer to access the APK file on the web. 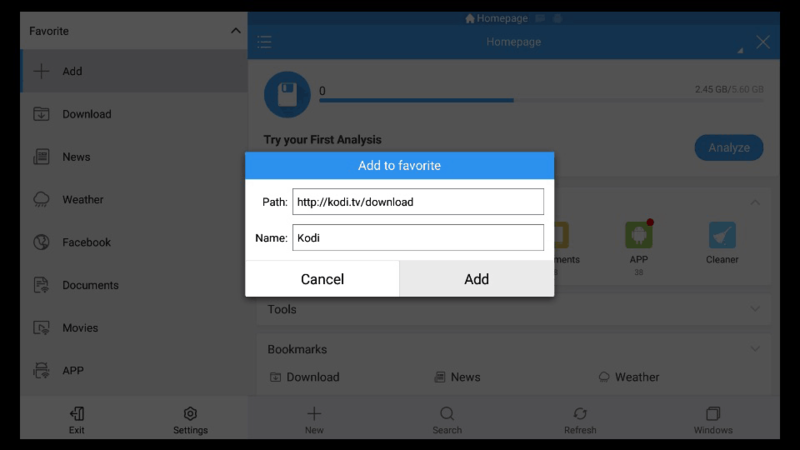 It's a really simple way to add an app, but you'll need a direct download URL for the APK file for it to work. 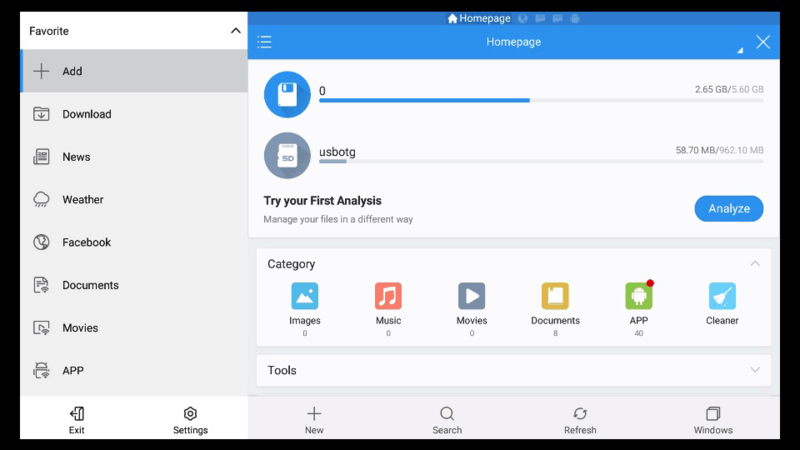 What you need: ES File Explorer and a download URL for your desired APK file. Just like the USB method, this method won't require debug mode, but you still have to allow apps from unknown sources. Go to Settings>System>Developer Options and set Apps from Unknown Sources to ON. ES File Explorer is, as the name suggests, a file browser app. 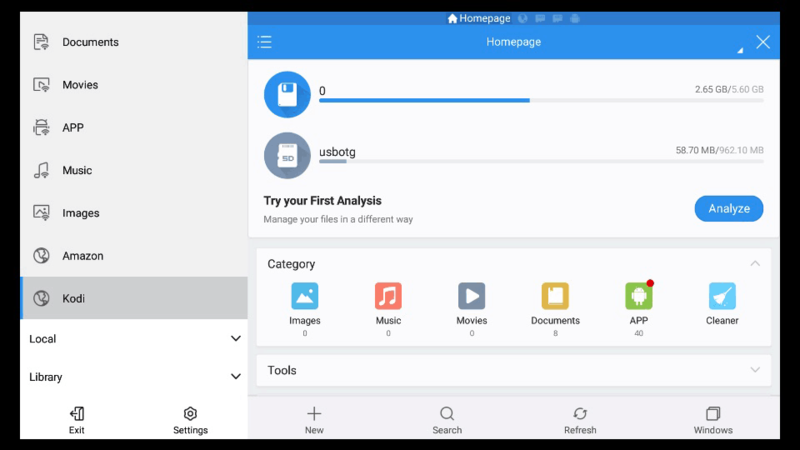 It's our favorite Android file explorer, and we highly recommend it for more than just its sideloading abilities. You can get ES File Explorer for free in the Amazon app store. If it's your first time opening the app, you'll have to hit back to exit a tutorial before you head to the next step. The “path” space should be filled by the web address to the app you want to sideload. For instance, Kodi's address is http://kodi.tv/download. “Type,” of course, is “http (Web).” As for the name, just enter the name of the app you're trying to download. Step 5: Scroll Down in the Menu Until You See Your New Link. Select It! You've just created a new shortcut in the favorites menu. Scroll down to it – it will have a little globe icon next to it. Click on your new shortcut. This will bring you to the download page. With your webpage loaded up here, you should be able to select the right download link. We're using Kodi as an example. Note that we're selecting the ARM version – the Fire TV has an ARM processor, not a x86. Once you've selected the download link, sit tight – this part can take a while. Soon, a download progress bar will pop up, and you'll be on your way. ES File Explorer will tell you when your download is complete. Select “Open File” in the pop-up dialogue box. This does exactly what you'd think it does. You'll have to confirm the installation on a new screen. After that, you're done – your new app should appear on your Fire TV just as any other app does. 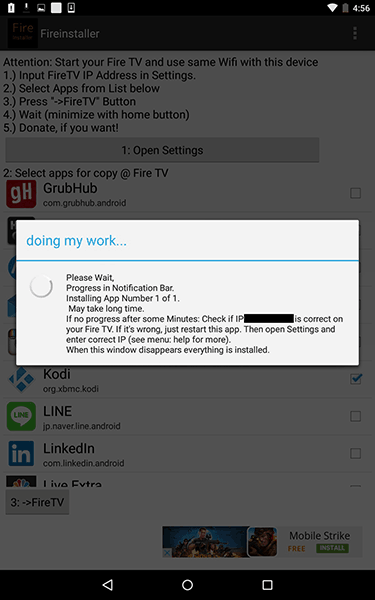 What if I want to get access to the Fire TV apps for my Android TV device? What then?